Home | Practice Areas | Personal Injury | Do I Really Need a Lawyer To Pursue An Injury Claim? You’ve been in an accident. The details of the accident seem straightforward to you. A car hit you when it ran a red light. Perhaps it sideswiped you and forced you off the road. Maybe they weren’t looking when they were backing out of their driveway and you didn’t have time to react when they lurched onto the street. Regardless of the situation, you believe the circumstances of your case will result in a quick judgment in your favor. As a result, you see no need to hire a lawyer. What’s not readily apparent is how fast an “open and shut” case becomes intricately complex. Proper handling of an injury claim requires an understanding of both law and medicine. There’s much more to receiving a fair and reasonable settlement than fappears at first glance. Missteps in the beginning can dramatically diminish the value of your entire case. Personal injury law is complex and the rules are unforgiving. Insurance company attorneys are ruthless. Identifying responsible parties and where to collect information can be difficult. The quick judgment in your favor has deteriorated into a miasma of contrary claims and finger-pointing. How Often Do Personal Injury Claims Go to Court? Is It Worth Hiring a Personal Injury Lawyer? Are There Any Specific Situations When Hiring a Personal Injury Lawyer Is Always a Good Idea? If you have been in a fender bender where there has been limited damage to your car or to the other person’s car and no one has suffered serious injuries, chances are good you will not need to go to court. But not always. In almost every motor vehicle accident, the key question is “Whose fault was it?” And even when, as in the cases above, the other driver caused the accident, insurance companies are often reluctant to pay anything. The reality is that the moment a question of blame arises there is a very good chance that your accident insurance claim will end up in court. The driver who backed out of his driveway and struck your car claims you were going too fast down the street and that the accident was your fault. The accident occurred in a remote location and the other driver says it was not him but you who was to blame for the accident. The person does not have insurance. Even if the other driver admits fault, their insurance company refuses to pay. It is easy to see how a “straightforward” case can easily turn into a complicated mess. Suppose you needed treatment for something life-threatening. Would you trust your care to just anybody? Would you trust it to the reading you have done on the internet about homeopathy or self-medication? Do not deny yourself experience and skilled practice in the name of saving money. In the above example, a doctor would tell you you are risking more than your healthcare dollars in the long run. It is much the same when you choose not to talk to a personal injury lawyer before you accept any settlement from an insurance company. 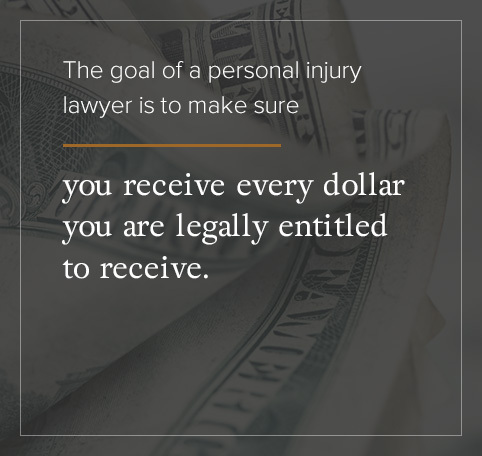 The goal of a personal injury lawyer is to make sure you receive every dollar you are legally entitled to receive. All the other parties to the case — the other driver, his or her insurance company, his or her insurance company’s lawyers — are determined to prevent you from receiving what you are owed. Success in accident cases is frequently reduced to one simple premise: proving which party was at fault. Establishing blame is hotly contested. Proving who is responsible, convincingly, always requires an in-depth investigation. Private detectives may be hired. Witnesses are identified. Statements are taken. Subpoenas are served and photographs of the scene are taken. Would you know where to begin? What steps to take? What evidence to preserve? This is why hiring a personal injury lawyer can save you time and frustration and give you a better chance of a successful outcome. You have suffered a significant injury. Your medical bills are staggering and growing. Your injuries have resulted in a significant loss of income. Even in cases where you been severely injured, like those above, insurance company lawyers will try to reduce any settlement or compensation you would receive and may even try to deny the claim outright. Injuries that result in long-term or permanent disabilities: Long-term injury is considered an injury that lasts for a year or longer, while a permanent disability is one that affects you for your entire life. They not only have a deleterious effect on your quality of life but also have a significant effect on your chances of becoming or staying employed. Disputed liability: We’ve already mentioned how insurance company lawyers will do everything they can to find ways not to pay you. One of the more common is when an insurance company says its policyholder is not liable for the accident. This means they do not think you have enough proof to show that he or she is liable. So they do not feel they need to pay you anything. One of the main jobs of a personal injury lawyer is to carry out the kind of investigations you will need to prove the insurance companies wrong. Nonpayment: Sometimes insurance companies simply refuse to pay. This does not even have to be the result of the disputed liability. Imagine yourself going up against a team of lawyers whose entire careers are devoted to finding ways to disprove their client’s liability. There will be a whole team of them against you. And if you have never had any experience in dealing with the complex issues of personal injury law, they will probably take you to the cleaners. Hiring a personal injury lawyer who has resources of his or her own, to be your advocate against these insurance company lawyers, is one of the smartest moves you can make. Do I know and understand what statues of limitations apply to my case? Do I understand motor vehicle insurance policies and provisions, underinsured coverage and uninsured benefits? Do I have the same kind of financial resources that the insurance companies will have in order to cover all my expenses until my case settles? What will I do if I cannot settle my case? Should I give the insurance companies authorization to get my medical records? When should I start my settlement negotiations? How much should I demand? Can I prove why I deserve this amount? A personal injury lawyer serves many functions for his or her client. They listen to you, they take your case seriously, they gather evidence and information that is relevant to your case, they will help you understand all your options and advise you about what is the best course of action to pursue. They will handle your case personally and respond promptly to any questions you may have. They will document and calculate any losses you have suffered, both financially and physically. They file court documents, insurance claims and other important paperwork correctly and on time. They collect important pieces of evidence. If there are any witnesses to your accident, they will interview them. They are your representative during any settlement negotiations with an insurance company. They will let you know when accepting a settlement offer is a good idea and they will advise you that such an offer is unfair and you should continue your case. They will act in your best interests. Focus on personal injury: You would not want a doctor who specializes in repairing knees to operate on your brain. There are many kinds of lawyers who specialize in many different areas of the law. You want to find a lawyer who focuses on personal injury. Experience with car accidents: Now you want to refine it even further. You want to find a personal injury lawyer who has handled your kind of personal injury claim. A personal injury lawyer who specializes in slip and fall accidents or dog bites will not be as helpful as a lawyer who has worked for individuals who have been in car crashes. Reputation: While any personal injury lawyer will be helpful to you in a battle against insurance companies, it does not hurt to have a company on your side who has a reputation for winning a lot of those cases. Caseload: All attorneys handle many cases at one time. And a skilled attorney handles many cases almost all the time. This is not necessarily a bad thing. However, if an attorney is stretched too thin, it is probably best to look for one who is not quite as busy. Attention: Are you happy with the way your attorney treats you in your case? This does not mean they need to call or text you every single day. But are you receiving regular updates on your case’s status? Do they answer your questions professionally and patiently? Do they answer your phone calls within an acceptable period of time? Comfort level: This is one of the most important factors. You should evaluate your comfort level from the beginning of your relationship with your lawyer. Occasionally you will need to change course and hire a new attorney. But most of the time, you will find personal injury lawyers are attentive to your needs and do their very best to ensure a successful outcome for you and your family. Traps abound for the unwary thinking about handling their own case. Personal injury law is complicated. Successful outcomes can only come through experienced injury lawyers — insurance claim lawyers who know exactly when to act to maximize your compensation. A study conducted by the Insurance Research Council in 1999 showed that if you work with a personal injury lawyer, you are likely to receive compensation 3.5 times greater than if you do not work with one. You need a lawyer who knows the ropes. We are those lawyers — injury lawyers available to help you win fair and reasonable compensation. Your main job is to get better after an accident. Our job is to recover your damages. When you try to work your way through personal injury law and make a personal injury claim, the result can be frustrating and confusing as you try to sort out the complex rules and procedures that apply in your state. Our team of experienced and knowledgeable personal injury lawyers wants to make sure you receive the maximum amount of compensation to which you are entitled. At KBG Injury Law, you are not just another client. You are a person who needs our help. Our goal is to give each client the individual attention and consideration they deserve. We understand how a wrongly denied insurance claim can affect you emotionally and financially and how important it is for you and your family to be able to resolve all issues as quickly as possible. We invite you to take a free consultation where we can talk about your situation and determine if there are ways we can help you. You can reach us 24 hours a day, toll-free, at 1-800-509-1011. Or you can request a free consultation and one of our talented lawyers will get back to you as soon as possible.